Portland, OR – October 5, 2015. 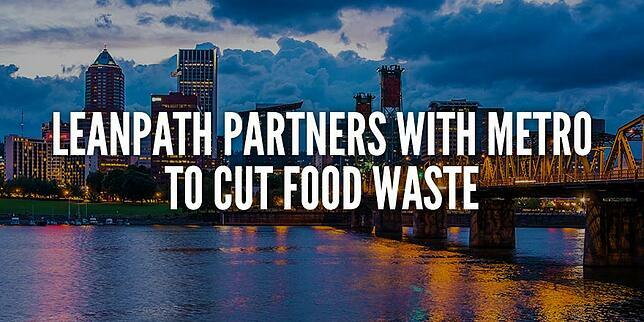 Portland-based LeanPath, Inc. has partnered with Metro, Portland’s regional government, to provide an industry-first rebate program that assists foodservice operators in cutting food waste. The Metro Smart Kitchen Initiative offers a $2,000 rebate to up to 10 businesses for up to two years to assist operators in implementing the LeanPath 360 Food Waste Prevention System. This system meters food wastage using equipment and software, creating a waste-aware kitchen culture and feedback loops that drive food waste prevention at the source. Typical LeanPath customer results include a 50% reduction in pre-consumer (kitchen) food waste and up to a 6% reduction in food costs. LeanPath was founded in 2004 in Portland, OR, and is active throughout the U.S. and internationally as the leader in food waste prevention systems. Local clients include Concordia University, the Oregon Zoo, and Linfield College, and national and international clients include Sodexo, University of Massachusetts, MGM Grand Buffet, and the University of San Francisco Medical Center. The rebate program will remain in effect until at least July 15, 2017. Qualifying foodservice operations include cultural/sports venues, educational institutions, healthcare facilities, hotels, and other organizations with foodservice operations with annual food purchases of $500,000 or more. Metro is the elected government of the Portland metropolitan area. Metro works with communities, businesses and residents in the Portland metropolitan area to chart a wise course for the future while protecting the things we love about this place. As part of that work, Metro plans and oversees the region's solid waste system – working with local communities and industry partners to reduce waste while managing garbage, recycling and composting in a safe, healthy and cost-effective manner. oregonmetro.gov. LeanPath, Inc. provides food waste prevention systems which enable foodservice professionals to dramatically reduce food waste, lower food costs, and operate more sustainable facilities. The LeanPath System is installed at hundreds of colleges, hospitals, casinos, corporate dining facilities and restaurants across the U.S. and globally. LeanPath has been featured in BusinessWeek, NPR, Forbes and many food industry publications. For more information, visit www.leanpath.com.